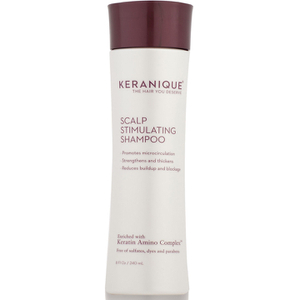 Keranique's Hair Regrowth Treatment is a hair loss solution that supports natural hair regrowth in women experiencing hair loss or thinning hair. Infused with 2% Minoxidil (the only FDA-approved ingredient clinically proven to help hair regrowth), the treatment is fitted with a nozzle for targeted application, allowing optimum delivery to the scalp for maximum efficacy. With continued use, hair growth will be supported. Prime the sprayer by holding the bottle upright and pump the sprayer 5 times to ensure delivery of full spray. Do not inhale mist. Apply 1ml with sprayer (6 sprays) 2 times a day directly onto the scalp in the hair loss area. Using more or more often will not improve results. Continued use is necessary to increase and keep your hair regrowth, or hair loss will begin again. 2% Minoxidil, Alochol 60% v/v, Propylene Glycol 20% v/v, Purified Water. 18 months and still working! the shampoo is great too! THAT lasts a lot longer than the regrowth treatment but HEY... it works!